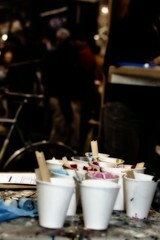 Cups of paint at Vanilla's NAHBS booth. We had so much to share from this past weekend’s handmade bike show that it took three Websites to cover it all. Along with continued coverage right here, you can also find CXHairs.com provided words, pictures and videos at our friends’ sites. Cyclocross Magazine (www.cxmagazine.com) has a short article and gallery up from Saturday at the show. Gam Jams (GamJams.net) has an article covering bikes of all stripes. There is also a cool video at GamJams showing off Serotta’s new fit tools. Cyclocross Magazine will soon be running a video interview with one of our favorite custom frame builders, Mike Zanconato. Until then, go check out Mike’s Web site and blog at www.zanconato.com.